Every season there are a few shows that diligent theatre-goers know not to miss. They come in various forms- remounts of proven hits, highly anticipated new works, sometimes a rarely produced text, or just a really well-cast classic- but they bring with them a sense of anticipation and a boatload of sky-high expectations. Right now in Toronto there are a surprising number of such productions. You can see the world premiere of part two of Susanna Fournier’s highly touted epic Empire Trilogy, remounts of out-of-town favourites The Virgin Trial and 1979, or a solo show by one of the country’s most beloved performers. 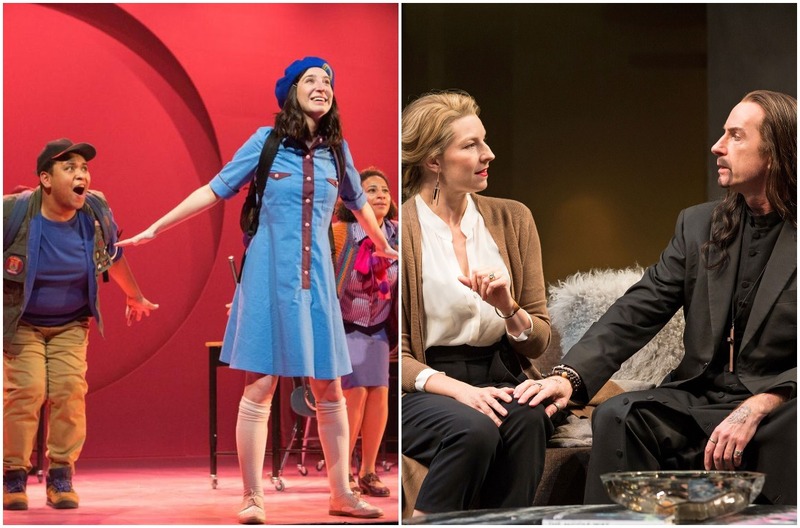 Perhaps first and second amongst these must-see events are Canadian Stage’s Tartuffe and Soulpepper’s Rose– two vibrant, ambitious, high-energy offerings from opposite ends of the can’t-miss spectrum. Tartuffe is a straight remount of one of the most succesful large-scale productions in recent Ontario history. It was a sure bet when it was programmed into the Canadian Stage season and, with only one significant casting change and little in the way of re-staging, it delivers almost exactly as expected. When it premiered in the 2017 Stratford season, the production seemed to exist in a magical sweet spot where proven material met talent so dependable that they could take the biggest of swings and never seem at risk of striking out. Translator Ranjit Bolt played fast and loose with Molière’s masterpiece, maintaining the playwright’s signature rhyming structure and impactful themes of religious hypocrisy and insider invincibility while updating the language to comically intense modernity (curse words, pop references, and internet slang all improbably abound). Director Chris Abraham and his superb ensemble leaned in to the timeliness and silliness in equal measure and the production’s emotional and intellectual point hit in the uncertain times of 2017 like a knife to the back while you were busy dancing to French hip hop and laughing along with Anusree Roy’s Critics’ Pick Award-winning performance as defiant maid Dorine (for more on what did and does make this production work, read my original review HERE). In this iteration, Roy is replaced with Akosua Amo-Adem (at opening Roy was seated right behind me, helpfully pointing out with her laughter anything that was new to the remount). Amo-Adem’s Dorine is more of a showboat than Roy’s, less in her employer’s face than mugging through the fourth wall. It’s a different take and surely just a matter of taste which you prefer. For me, Roy hit harder on Dorine’s truth-to-power good intentions and I missed that in this version. Everything else about the production remains pretty much in place, which is mostly a good thing. The pacing and movement of Abraham’s direction shines just as brightly this time around, the slapstick perhaps a little more emphasized though that could be a trick of my memory. The great Tom Rooney is every bit the iconic sleazebag that earned him raves in Stratford and Graham Abbey‘s infuriating Orgon remains pitch-perfect in his thick-skulled patriarchal ways. Maev Beaty is vibrant and intelligent, Mercedes Morris an elevated ingenue, Johnathan Sousa and Emilio Vieira impetuous but clear-eyed, and Michael Blake a grounding force. But here’s what goes wrong with a close to identical remount of a highly topical piece- it’s not 2017 anymore. There was surely a time when you could pluck a piece like this out of its exact moment in history and set it down eighteen months later and all would be well, but the world is spinning at an unprecedented rate right now and we’re already miles away from where we were when this Tartuffe first premiered with its overt Trump references and warnings about mediocre yes-men. The President of the United States, whom we’re to picture when mention is made of the King in this production, has said and done so many outrageous things in the past eighteen months that lines like “bigly” and “alternative facts” don’t quite work the way they once did. So much water has gone under the bridge since “braggadocious” that we can barely catch our breath. The Stratford/Canadian Stage/Groundling/Crow’s/David vs. Goliath epic co-pro Tartuffe is still great- it will always be great and it easily surpasses the high expectations that accompanied its high profile remount- but with material this hyper-current, even less than two years on, it’s already faded just a little. On the other end of the spectrum, right now Rose is as big and bright as it will ever be. After three years of development, this Sarah Wilson/Mike Ross collaboration based on a Gertrude Stein story is being billed as Soulpepper’s first original musical (though such definitions are definitely up for debate considering Spoon River, Alligator Pie, and (re)Birth are all arguably original musicals too). It’s got a big bright set and a big bright cast singing big bright songs and it all feels a little nonsensically overwhelming if undeniably charming in a big bright way. Hailey Gillis‘ beautifully sincere performance as the shy eponymous 9-year-old is the one element of the production that feels strictly earth-bound in any sort of adult-identifiable sense. The trio of logger narrators led by the always great Frank Cox-O’Connell may well have been the grounding touchstone I was looking for but the sound balance in the theatre was off and much of their material got lost in a sea of strumming. Everything else about Rose’s hometown and her wacky quest of self-discovery has a Petit Prince via Wes Anderson vibe that seems too incomprehensible to appreciate until you consider that maybe it’s not about you and what you find comprehensible. Lorenzo Savoini‘s set and Alexandra Lord’s costumes are all bold colours and clean lines; Gregory Prest‘s direction is full of basic shapes and broad characterizations. Rose‘s world contains none of the messy grey subtleties of adulthood but it does have a chorus of lions in platform heels and gold sequins- it’s all big and bright and outwardly simple but also totally confusing and if that’s not a nearly perfect encapsulation of what it’s like to be a kid I don’t know what is. The plot made absolutely no sense to me but I’ve been 40 since I was 12 so it wouldn’t have been effective if it was something that made sense to me. Rose‘s internal logic, if it has any, is kid logic and it’s better for it. What does make sense, hopefully, to every audience member is the important stuff- Rose’s struggle for self acceptance and the strength of the friendship that is the production’s beating heart. Willie, as played by the exuberant Peter Fernandes at full tilt, is the goofy confident best best friend that dreams are made on and he’s the real must-see draw of this anticipated show that doesn’t on the whole quite live up to its sky-high expectations. The book needs a trim, some of the songs need a key change, and maybe the plot’s childlike randomness could use just a dash of adult-friendly focus but within the rough edges of an over-hyped theatrical event is a nice little piece with a big heart that’s trying to remind us of how we used to see the world before we insisted it all make perfect sense. Such a Short Time Together?